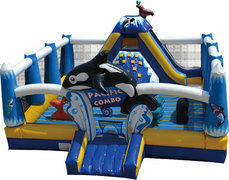 If you're looking for more than a bounce house, this is the one. The Pacific Combo Adventure Park features a rock-climbing wall, a slide, and underwater creatures to crawl around and have fun with. There are inflatable, child-size seahorses to crawl under. There are inflatable star fish to crawl through. There is also a smiling shark to ride on. Perfect for large groups of kids at one given time! i.e. churches, schools, events, etc.